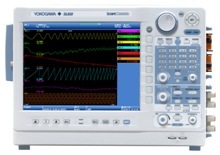 The DL850 ScopeCorder Series are modular, waveform recording instruments that can measure voltage, current, strain, acceleration, and other phenomena-- simultaneously. With high speed sampling, high isolation withstand voltage, and multichannel measurements, the DL850 Series offers powerful support in the development, evaluation, and quality control of energy efficient devices. What's New: Two new modules and DC12V Power Drive (option) released.